FFA - REVshare companies stop advertising on Al Jazeera America. The Relion Group and Tax10000.com stopped advertising on Al Jazeera America thanks to the emails of concern that Florida Family Association supporters sent to their corporate officials. 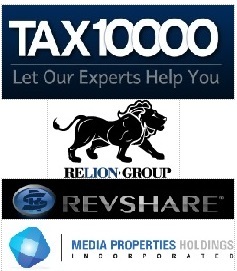 The Relion Group and Tax10000.com are registered to Revshare which bills itself as “Television’s Largest Cost-per-action Advertising Network.” Revshare is owned by Media Properties Holdings, Inc.
Florida Family Association sent out one email alert on September 17, 2013 regarding the REVshare companies' frequent advertising on Al Jazeera America. FFA supporters sent thousands of emails to company officials. The Relion Group and Tax10000.com advertisements have stopped airing on Al Jazeera America. The total number of companies advertising on Al Jazeera America has dropped to seven. There were NO NEW companies advertising on Al Jazeera America.